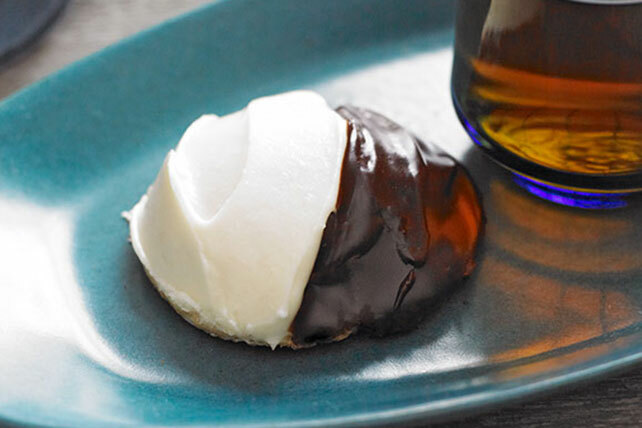 You haven't lived until you've tried a homemade black-and-white cookie. But you don't need to travel all the way to New York for one of these sweet treats - you can make them at home! Combine flour, baking powder and soda. Beat 1/2 cup butter and granulated sugar in large bowl with mixer until light and fluffy. Blend in egg, sour cream and 1/2 tsp. vanilla. Gradually add flour mixture, mixing well after each addition. Drop heaping tablespoonfuls of dough, 2 inches apart, onto baking sheets sprayed with cooking spray. Bake 10 min. or until edges of cookies are golden brown. Cool on baking sheets 2 min. Remove to wire racks; cool completely. Microwave Cool Whip and chocolate in medium microwaveable bowl on HIGH 1-1/2 to 2 min. or until chocolate is completely melted and mixture is well blended, stirring after each minute. Let stand 15 min. to thicken to spreading consistency. Beat cream cheese, remaining butter and vanilla in small bowl with mixer until blended. Gradually beat in icing sugar. Spread onto half of each cookie; spread chocolate frosting onto remaining cookie halves. Let stand 2 hours or until frostings are firm. Store cookies in tightly covered container in refrigerator up to 24 hours. For best results, bring cookies to room temperature before serving.